Why Jeffries Came Back for Johnson & Marciano Didn’t for Johansson! James J “The Boilermaker” Jeffries was considered one of the all-time great heavyweight champions when he retired after defeating Jack Munroe in 2 rounds in August of 1904. His record was 19-0-2 (16). When Jack “The Galvestan Giant” Johnson became the first black champion defeating Tommy Burns in December of 1908 the white race seemed to be quite upset especially due to the arrogance of Johnson. Johnson had four defenses with the first a draw with light heavyweight champion Philadelphia Jack O’Brien, NWS decisions with Tony Ross 11-6-2, NWS with Al Kauffman 18-1 and came off the canvas to KO12 middleweight champion Stanley Ketchell. Johnson as you can see was running out of opponents though also drawing “the color line” not defending against any of the black opponents since becoming champion. On the other hand even Jeffries Pastor in front of his congregation was embarrassing him saying “we have a coward amongst us” in trying to bring him back to take back the title from the black champion. Jeffries had gained over 100 pounds and hadn’t fought in 6 years minus a month. He unwisely came back at 227 to Johnson’s 208. Jeffries was 224 in his last fight some 6 years before. Jeffries was stopped in the 15th of a scheduled 45 round scheduled battle. In those days if you took a knee the round was over. Johnson was 38-5-7 going into this fight outdoors in Reno, NV. In Marciano’s decision not to return after retiring coming off the canvas to knockout light heavyweight champion Archie Moore in his last bout in September of 1959 he had no plans to return to the ring. Floyd Patterson would defeat Moore for the vacant title. There was talk of a Marciano Patterson fight but Marciano who would take months prior to a fight away from his family wanted to spend time lost with his wife and children. At retirement he was 49-0 (43) with 6 title defenses the first was a KO1 over “Jersey” Joe Walcott whom he won the title over with a KO13 while behind in the scoring 4-7, 5-7 and 4-8 needing a knockout to win. 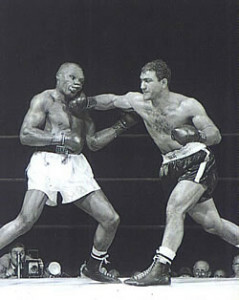 Marciano went onto KO11 Roland LaStarza in 1953 who he had won a split decision over in 1950 before becoming champion. He then defeated the former champion Ezzard Charles twice. The first was a decision 8-5, 9-5 and 8-6 and in the rematch Charles split Marciano’s nose so bad a only a knockout would save his title from the referee or ring physician possibly stopping the fight though ahead 5-1 and 6-1 twice. Then after 8 months he knocked out the British Empire champion Don Cockell 66-11-1 in 9 rounds with the Moore fight to follow. Patterson after defeating Moore for the vacant defended his title 6 times all by knockout until he was knocked out by Sweden’s Ingemar Johansson. This is when Marciano felt he would come back to bring the title back to America. He spent time alone nearby his home trying to get back in shape. He said the desire wasn’t there anymore. Patterson would come back to win the title from Johansson bringing back the title to America.